With the annual Cleanup Columbia city-wide trash pick up event occurring this past weekend and the 40th anniversary Earth Day Festival coming up on Sunday, May 2, many Columbians are in gear to help the environment. 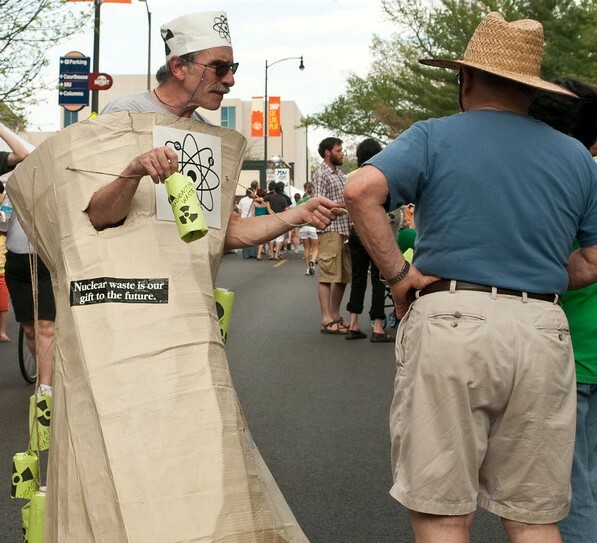 The 2010 Earth Day Festival was originally scheduled for Sunday, April 25 but was postponed due to rain. These festivities prove to be useful tools for getting the community involved by beautifying the city while allowing them to get in touch with nature. But Columbia residents don’t have to stop there. The Columbia Earth Day Coalition encourages the community to simultaneously celebrate and to make Earth Day a stepping stone to a more sustainable future. The city provides outlets for helping the environment and enjoying the outdoors year-round, including numerous parks, green spaces and recreational facilities, a well-developed recycling program, alternative transportation options like the city bus route and bike trails as well as many volunteer programs and local environmentally friendly businesses. The Coalition will provide opportunities to learn more about these outlets and how to get involved as well as ways to participate in the Festival while minimizing one’s environmental footprint. Who’s behind Columbia’s green initiative? Outgoing Mayor Darwin Hindman, recently replaced by current Mayor Bob McDavid, was viewed by many as a major contributor behind the availability of these resources. Over the years, Hindman was frequently seen riding his bike to his destinations around town. He was also well-known for his avid support of Columbia’s parks and recreation. Hindman demonstrated this support by advocating events in Columbia to raise environmental awareness, including Cleanup Columbia and the Annual Mayor’s Challenge: Bike, Walk and Wheel Week which kicks off on Saturday, May 1 and continues throughout the week. Now that McDavid has taken the mayoral office, it appears the Columbia community still shares the values its former mayor stood behind. Perhaps it was not Hindman but the people he represented all those years that inspired him to adopt his disposition. The city of Columbia is composed largely of a collegiate population filled with students, professors and graduates bursting with visions of an ideal, harmonic world rather than our world’s current state of consumerism and environmental degradation. These ideas are reflected in student groups like Sustain Mizzou and Columbia College’s Environmentally Conscious Organization (ECO) who both promote the awareness of environmental issues and attempt to work toward solutions to these problems through recycling and other volunteer efforts. No matter how the green initiative began, Columbia has it. So, why do many Columbians feel the need to support environmental causes and sacrifice so much to ensure that their lifestyles reflect their values? Some may say that their ideals are radical and unrealistic; that the small changes they are making will not impact the world as a whole. Despite these negative attitudes, Columbia’s environmental community strives onward. While each individual has his or her own reasons for doing so, most say it’s not just for the environment but for the community and future generations as well. Who's who in Columbia's environmental community? Mid-Missouri Peaceworks and its Center for Sustainable Living are thriving forces behind sustainable living in Columbia. Their headquarters, the Peace Nook in downtown Columbia, is a referral center for social change activism and also a nonprofit store that sells a variety of items including books, music, environmental products, fair trade imports, natural foods and more. The Nook is run primarily by volunteers, and all proceeds go to the Peaceworks’ educational programs. Mark Haim, director of Mid-Missouri Peaceworks, said, “What comes to mind when I think of Columbia’s environmental community is primarily environmental education and advocacy groups, which Columbia has in abundance.” Some of the groups Haim listed include PedNet Coalition, GetAbout Columbia, Columbia’s chapter of the Sierra Club, Smart Growth Coalition and the currently very active Columbia Earth Day Coalition. The Earth Day Coalition educates people about food, gardening, energy conservation, renewable energy, alternative transportation, nature and much more. At this year’s Earth Day Festival, the Coalition encourages citizens to make one or two resolutions to green their lives and will offer information and access to resources to facilitate this. Sustainable living booths, displays and educational activities designed to inform and inspire will be clustered along Eco Avenue at the Festival. “Eco Avenue was conceived to assure that folks attending could find easy access to ways to live more sustainably without having to search the entire Festival,” said Eco Avenue Coordinator Rose Wise. 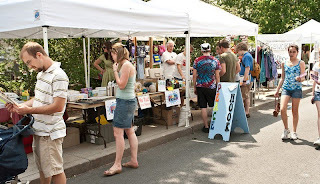 New this year to the Festival is the Eco Avenue Schoolhouse. This area will feature a workshop space with classes on composting, geothermal energy, green burial, solar power, worm composting, renewable energy and urban hens. 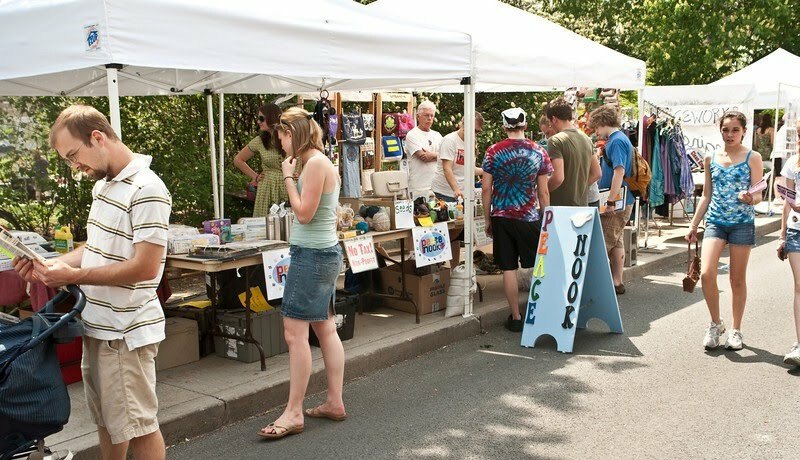 In addition, more than 200 booths will fill five city blocks with environmental education, non-profits, businesses, artisans and government agencies. Families attending Earth Day will have a chance to visit Kids’ Park. There they can get involved in a wide variety of fun, creative activities, most with a nature theme. “Research shows that kids who are connected to nature are more confident, have more friends, are healthier emotionally and physically and do better in school,” stated Professor Jan Weaver, Earth Day’s Kids’ Park Coordinator and MU Director of Environmental Studies. Activities that will be offered in Kids’ Park include: insect bookmarks, leaf/flower rubbings, nature temporary tattoos, newspaper mushrooms and flowers, stilts, crayfish and other wild creatures, bark boats to float, an inflatable cave, natural objects and recycling activities. The Kids’ Park activities are provided by many Earth Day volunteers with the help of several organizations, including Columbia Parks and Recreation, Missouri Department of Conservation, MU Conservation Biology Program, Hickman High School Biology Club, Missouri River Relief, Smithton Middle School Green Team and Friends of Rock Bridge Memorial State Park. Columbia’s Earth Day Coalition says the take-home message from Earth Day is that each of our actions and choices matter; that we are all responsible and that environmental citizenship is a multi-faceted process that involves personal behaviors, community action and engagement. Members of the Earth Day Coalition include Alpha Phi Omega Service Fraternity, Columbia Parks & Recreation, Columbia Public Works, Downtown Columbia Associations, 89.5 KOPN, MU Environmental Studies, MU College of Human Environmental Sciences Extension, Ozark Avalon Church of Nature, the Peace Nook, Peaceworks’ Center for Sustainable Living, Sustain Mizzou and the Voluntary Action Center. For a detailed schedule of events, please see the Columbia Earth Day Coalition Web site at http://www.columbiaearthday.org/. Columbia’s 2009 Earth Day Festival. Photo courtesy of Brandon Smith and www.columbiaearthday.org.